Correctly gauging dangers on the Internet and taking the necessary steps to avoid them is an ongoing challenge. This is especially true for young users and those who are less technologically savvy. However, securing a single computer system by adding ad and tracking blockers and deactivating specific services and content is a relatively straightforward task. Hardening the local network and mobile end devices like smartphones is not so straightforward, and many users find themselves out of their depth. Upribox  can offer assistance. Taking its name from the idea of a "usable privacy box," upribox is built with a Raspberry Pi 2 (RPi2) at its heart. Just a few mouse clicks create appropriate security solutions for a wide variety of scenarios. 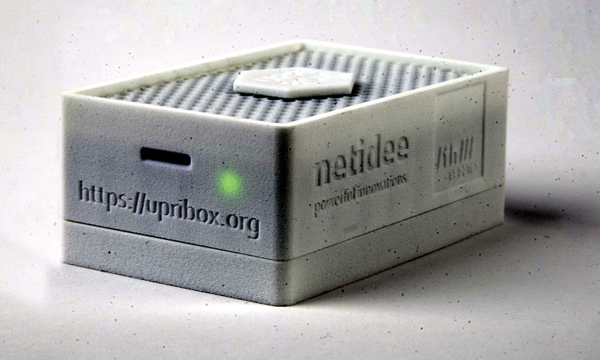 Upribox originated as a university project  with funding from the nonprofit Internet Foundation Austria (or IPA) and Netidee . The goal of upribox is to protect the privacy of Internet users as efficiently as possible with an easy-to-operate solution built out of a combination of software and hardware. With this mission in mind, a team of developers working with Dr. Markus Huber developed the software. They also built a small batch of prototypes based on the RPi2 (Figure 1), which will be followed by actual production devices. Meanwhile, the software has been released as free software under a GPLv3 license, and it is available for download. Users can easily install and test the software on a Raspberry Pi to make a DIY upribox . Once connected to the Internet, upribox generates its own wireless network and makes three services available to the user. The Silent WiFi service lets the user browse the Internet without ads and trackers by filtering both tracking software and invasive ads found in apps and web pages. In creating this service, the development team specifically addressed the ads and trackers that are built directly into apps. These "in-app" ads have grown in use on mobile devices. Once the user installs this type of app on a smartphone, advertisements will appear whenever the app starts. These obnoxious pests are not just annoying when they appear on a mobile device. They can also be dangerous because of their ability to capture both customer data and the exact geolocation of the smartphone or tablet. This means the location of the user becomes part of the information collected by the app. These collection capabilities allow entities associated with such apps to create a geotracking profile of the user. The second upribox service is the Ninja WiFi mode, which creates anonymous access to the Internet via the Tor  network and works alongside the ad and tracking filters. This mode is designed primarily to avoid attempts at censoring and to prevent overly curious providers from investigating the browsing habits of the user. The third service is an operating mode, which makes it possible to use upribox as a VPN server, thereby providing protection for the user who accesses the Internet via public hotspots. The advantage to an external privacy solution like upribox is that it significantly reduces administrative work for the end user by obviating the need for installing browser-dependent add-ons on each computer, tablet, and smartphone. Efficiency is also increased when browsing is protected from obtrusive advertising. These ads can inflate a page so much that actual content becomes difficult to find. With the use of upribox, the ads disappear from the screen, thereby letting pages build faster because of the decrease in data volume. The developers only used free software for the project. The technology built into the system is proven, such as the domain filter realized via Dnsmasq. Together with blacklists comparable to those used in the Firefox extension Adblock Plus, the filter hides unwanted content. The proxy server is also utilized to block URLs based on their content. The VPN server uses the OpenVPN protocol and offers secure, encrypted communication. The technologies are kept transparent for the benefit of the end user. As a result, upribox does not need any additional manual configuration.